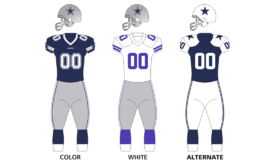 The 2004 Dallas Cowboys season was the 45th season for the team in the National Football League. The season began with the team trying to continue on their winning 10–6 record in 2003. However, the failed to improve on that record and finished at 6–10. Even before 2004 season began, the Cowboys would face adversity and be forced to adjust. Coming off their first winning season in 5 years, the team, under Bill Parcells direction, would continue to bring in veteran talent and draft promising prospects. In the off-season, the Cowboys would sign quarterback Vinny Testaverde and trade for disgruntled wide receiver Keyshawn Johnson. Both Testaverde and Johnson had played for Parcells when he had coached the New York Jets, and both were eager to reunite with Parcells. Johnson was especially happy to be in Dallas, as he had been deactivated for the final six games of the previous season while with the Tampa Bay Buccaneers for "conduct detrimental to the team". In return for Johnson, the Buccaneers received Joey Galloway. The draft saw the arrival of running back Julius Jones, cornerbacks Jacques Reeves and Nate Jones, and college quarterback turned wide receiver Patrick Crayton. In owner Jerry Jones continuing quest to acquire quarterback talent, the Cowboys would trade for the rights to Drew Henson, another baseball player attempting to return to football. Henson starred at Michigan, even keeping future NFL superstar quarterback Tom Brady from claiming the starting job outright. His struggles in the New York Yankees farm system would lead him to reconsider his career and opt for a return to football, similar to Chad Hutchinson, whom the team had acquired only two years prior. Hutchinson would later be released. The Cowboys traded their first-round selection to the Buffalo Bills in exchange for second and fifth-round selections and a 2005 first-round selection. The Cowboys traded their original fifth-round selection to the New Orleans Saints for in exchange for sixth and seventh-round selections. The Cowboys traded their original sixth-round selection to the Green Bay Packers for wide receiver Terry Glenn. The Cowboys traded their sixth-round (acquired from New Orleans) to the Oakland Raiders in exchange for two seventh-round selections. The Cowboys traded their seventh-round (acquired from New Orleans) selection to the Tampa Bay Buccaneers for fullback Darian Barnes and a seventh-round selection. The Cowboys traded their original seventh-round selection and a 2005 sixth-round selection to the Oakland Raiders for defensive tackle Kenyon Coleman. The original selection was acquired through trade via Oakland. With the opening of training camp, the team seemed poised to take the next step, however this would soon change. Within the first week of camp, the Cowboys would shockingly release starting quarterback Quincy Carter. The move came with no warning; reporters at training camp became aware something had occurred when Carter did not suit up for practice and was later seen being escorted from the Cowboys facility. Though never verified by Carter or the team, it has been speculated that his release was prompted by a failed drug test administered by the Dallas Cowboys, an action prohibited by NFL rules. Rumors began that Carter had already entered the second phase of the NFL's substance abuse program, meaning he had twice failed NFL mandated random drug screenings. Test results are not made public but notices are sent to team officials. A third violation of the substance abuse program results in a mandatory suspension, and the Cowboys, unwilling to risk losing a starting quarterback during the season, began to monitor Carter with its own drug tests. Carter's formal protest of his release through the NFLPA as well as his subsequent troubles with drug addiction appear to lend creadence to this scenario. This move had an ironic long-term effect on the team. Had Carter remained (along with Testaverde and the financially invested Drew Henson), second-year QB Tony Romo would have been fourth on the depth chart and likely cut from the team. When Carter left, Romo moved up to #3, and would eventually be a pro-bowl starting quarterback for the Cowboys. As a result, Vinny Testaverde would be the opening day starter for the Cowboys. His extensive experience and veteran presence was an asset to the team, especially to young undrafted practice squad addition Tony Romo, but failed to produce many points behind an inconsistent offensive line. Dallas' defense would also regress from the previous season, especially the secondary which lost starting cornerback Mario Edwards in free agency and longtime mainstay and team leader safety Darren Woodson to injury. The result was a defense often on the field for long stretches and an offense constantly playing from behind. Following a loss to the Baltimore Ravens in which he played well in mop-up duty, Drew Henson would start the annual Thanksgiving Day game against the Chicago Bears. Though neither team produced much offense, Henson would flounder, and Testaverde would be brought in midway through the third quarter to a chorus of boos. The game still provided excitement for Cowboys fans as rookie running back Julius Jones, who had been injured early in the season and had just returned in the previous game, put on a masterful performance rushing for 150 yards and two touchdowns in leading the team to victory. Jones' momentum would carry over to the next game where he would rush for 198 yards and three scores in a dramatic win over the Seattle Seahawks. In only 7 starts(8 games overall) Jones would rush for over 800 yards and seven touchdowns, though not justifying Parcells' decision to pass on running backs Steven Jackson and Kevin Jones in the draft. As the season progressed, Parcells would continue to mold the team steadily implementing his preferred 3-4 defense and allowing his assistant coaches on offense, particularly Maurice Carthon and Sean Payton, to take more control. Despite the individual achievements and development, the end result was a 6–10 season. Other notable additions to the team this year include linebackers Ryan Fowler and Scott Shanle as well as former Heisman Trophy winner Eddie George in his final NFL season. ↑ "2004 NFL Draft Pick Transactions". ProSportsTransactions.com.